Cute toddler picture ferrets out radicals and rubes from "Higher" Education. The greatest con in America today is the idea that the non-profit, higher education industry is working to create a stronger, more educated, prosperous society. It is not. Indeed, in many ways, the not-for-profit or non-profit institutions are nothing more than revenue predators whose first mission is to draw in customers to feed an army of tenured professors and career administrators. The second mission of this industry is to advance a radical agenda of social warriors by creating, promoting, selling, and pushing a series of programs and degrees that have little market value. These programs teach students what to think rather than how to think, and they dump kids into a competitive, global job market with nothing but anger and debt. The third mission is to provide kids an “education,” at whatever it costs. The industry’s priorities are backwards, and Americans are paying the price of the tenure tax in crushing debt. On the streets of our cities, we are paying the price in riots and discord. By education, the industry really means a degree from an accredited university. Do you know who accredits universities? People inside the education industry. There is a stark difference between having a degree and being educated. The diploma attests to the fact that you paid for a degree and met the university requirements to obtain the degree. It says little about the value of your degree or whether you learned a how to think. Becoming educated and informed is a life-long journey. It’s not a four-year program. The institution from where you earned your degree, your field of study, and your performance may give the market clues to your success and ability in that program. It may also measure for the market a baseline to determine whether an employer should take a risk on you. Employers will rightly view one who goes to Harvard and studies business, graduating with high honors, in a kind light. The market might be less favorable to a graduate of Becker College with a degree in Global Citizenship. Both institutions are private, “nonprofit” entities. Going deep into debt for nearly any degree is a great risk, and one most young students don’t appreciate. Taking an economic risk and investing in one’s own future is smart, if the investment is smart. Many such investments are not, and the institutions are less concerned about where you will be financially in 10 years than where they will be in their own next budget cycle. When American educational consumers understand this reality, they can begin to make better decisions. My forthcoming book is a much deeper dive into higher education, its costs, and why and how the structure is dangerous, costly, self-interested, and in need of immediate reform. I am not at all opposed to education. In fact, I am for it in every way … every day … and for a lifetime. I am opposed to a culture that pushes kids into debt and churns out “degreed” citizens unable to think or find productive work to pay their debts. Americans simply do not think enough. In fact, in our politics, we feel, emote, and react, but we do very little thinking. Thinking is hard, and it requires introspection and analysis. It requires people to read, test hypothesis, question conclusions, and ultimately find answers through drawing reasonable conclusions from verifiable facts. As a country, we stink at this. In fact, we can hardly get the average political consumer to read past the title of a story, let alone dig into it and think about it. The result of a country that does not and will not think is a decline in the quality of debate, the outcome of public policy, and the general civility that is essential to a free, prosperous, people. The rise of political zealotry in a party-based system, rather than a thought based system, is a key contributor to this decline of discourse. 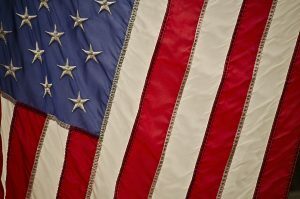 Not only are Americans generally less thoughtful and therefore less informed, they are at many times less willing to be thoughtful and informed. 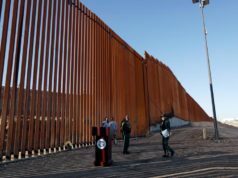 I call it the great American wall. In decades past, a college degree was the symbol and an indicium that a person had a level of education, responsibility, and independence that alone made them a good economic bet for many employers. We are way past that quaint and by-gone time. While it is true that a college degree remains the entry requirement for most jobs, merely having one … in any subject … does not mean you are sure to be hired. Moreover, with the spiraling cost of a degree, it is often likely that the job you obtain may not be sufficient to justify the paper in which you invested. It has always mattered, for preference and market purposes, where one gets a degree, in what field, and how well one did. It just simply matters so much more now, because the market is flooded with college degrees of suspect quality. Many of these degree programs don’t provide skills that are in market demand. In fact, many of these students come out seemingly missing the essential component of any degree … the ability and desire to think critically. What happens when adulthood is put off by unemployment, deep debt, and political hypertension? What happens when the promise of getting a college degree, no matter what, transforms into disappointment and joblessness? What happens when we churn out global citizens, experts in gender studies, critical race theory, and dozens upon dozens of other “majors” into a job market that needs few, if any of them? We are creating an army of social justice warriors, fueled by indoctrination. 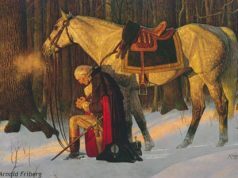 Motivated by an ideology of big government entitlement, trained to see division on race, gender, orientation, religion, and class, these “warriors” are at war with a system that has let them down. Unfortunately, they think their enemy is the people who have all the things they want. Instead of turning back to examine critically an industry that indebted them in tomfoolery, they are on our streets rioting, fighting, protesting, chanting, and attacking everything they hate, resent, or distrust … without thought. 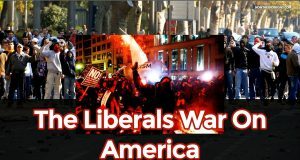 They are the army of the altleft, and whether they are merely rubes for radicals, or active BLM or Antifa members, the result is the same. They are at war with thought and with the systems and structure that gave birth to liberty and our grand experiment to create and perfect it. 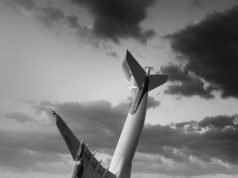 Make no mistake; the higher education industry is cranking out altleft radicals because it is hiring, retaining, and growing an army of “Professors” in fields of study that are again, of dubious value. Meet this peach from the University of Tampa. 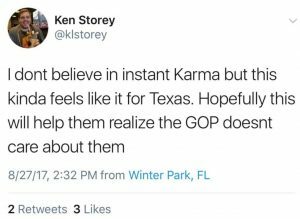 He thinks Texans deserve Hurricane Harvey for voting for Trump. A visiting sociology professor who focuses on urban issues, “Professor” Storey was “relieved of his duties” by the University. That means he didn’t have tenure with them. Not surprisingly, those who collect the tenure tax and are not accountable, find his dismissal “absolutely ridiculous.” It’s not. It’s called the real world, and those with tenure ought to realize that with great power … comes great responsibility. Here’s more on her thoughts on deconstructing white privilege. Those “professors” are shining examples of altleft warriors in classrooms instructing your children … and producing recruits. Below is another perfect example of such a person who made herself a bit more famous for her activism recently. In so doing she picked up supporters and defenders, raised her profile, and probably helped her personal mission. She also gave serious thinkers a solid example of the type of suspect, altleft, radicals using “academic freedom” to produce warriors rather than thinkers. 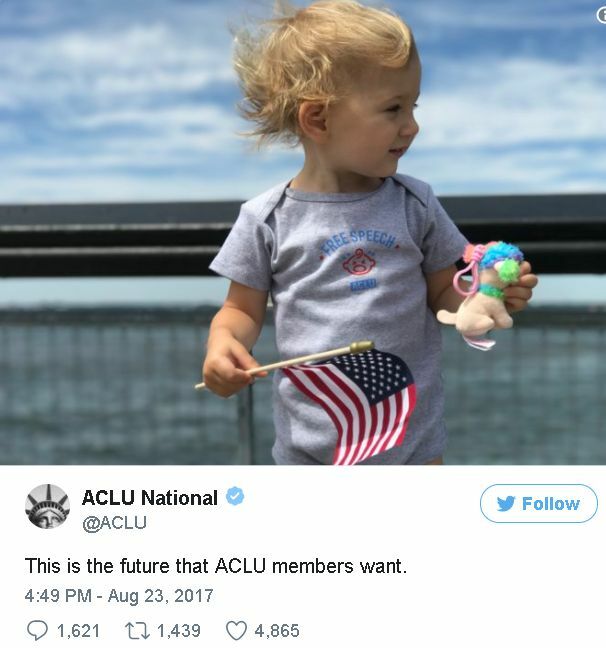 When the ACLU tweeted out a cute picture of an innocent child waving a flag and holding a cute little doggy, suggesting, of course, that ACLU members see innocent children as our future … the altleft saw something else. “Professor” Nyasha Junior typified the altleft response to this harmless, well-intentioned tweet with a flippant response that can only be viewed as racist and ignorant, to the extent those terms are not redundant. 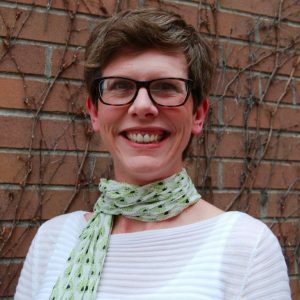 Unfortunately, a quick search showed she didn’t merely work at Temple, she is a professor. Indeed, her tweet says so much with so little. However, for those who want a fuller understanding of her racialism, radicalism, and “work,” they need only read her articles or look at her twitter feed. It’s easy to see what she professes. She is one of innumerable such people filling these institutions with costs and shoveling hate and stupidity into kids who will quite literally pay for it for their entire lives. She’s a racist who produces other racists. Make no mistake about; she undoubtedly doesn’t think she is at all racist. She surely thinks she is combating racism. She likely thinks she is fighting racism, remarkably, by dividing by race, promoting racial division, and engaging in un-useful, race-based, conduct. Her racial disdain and hate are what I have previously identified as affirmative hate. Sadly, we cannot move forward in unity on issues of race until we comprehensively address racism. In so doing, we must no longer excuse or rationalize hate of any kind. It’s not just visiting professors and tenured professors, it is also tenured Deans who run entire academic units who are part of the altleft, higher education establishment. 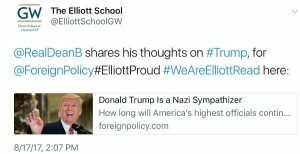 Meet the tenured Dean of George Washington University’s Elliot School of International Affairs. He thinks Trump is a white supremacist and Nazi sympathizer. The University’s official twitter page plugged his piece. To combat racism and radicalism effectively, we must again become a society of thinkers. The education industry must make immediate reforms, and among those reforms must be a strong, comprehensive review of the programs, classes, courses, and majors that universities are pushing on our kids at great cost. We need tenure reform too, as the costs of these programs is reflected in a tenure tax where lifetime employment is the result of fields of study that universities create and feed, but never eliminate or reduce. Universities hunt for revenue among weak prey, drawing them in under the guise that “every kid must get an education in something.” The institutions get the cash, professors get protections, and the kids get the bill in a tenure tax that is breaking us economically and socially. So-called “Academic Freedom” has a life estate at the intersection of radicalism and irresponsibility. You are paying the upkeep. As a result, America is getting more “educated,” less informed, and deeper in debt. If you want to know why your tuition is so high, it’s because stupid is expensive. ** That same law degree would now cost me roughly $90,000. Wages for graduates in that industry are nearly stagnant, but the cost of the degree has tripled.